Integrating mental health services and primary care has long been seen as a key step to achieve better health outcomes. Nowhere is the need for integrated care more urgent than among America’s veterans, who often face complex physical and mental health conditions. Roughly one in three Veterans Health Administration (VA) primary care patients have mental health comorbidities. However, despite the widespread support for integrated care, actual translation into common practice has been challenging. To accelerate this process, several offices in the VA have joined forces to implement a model that deploys peer specialists at the crossroads of mental health and primary care. Health goals are the most popular New Year’s Resolutions, such as losing weight, quitting smoke, exercising more, and eating healthier. 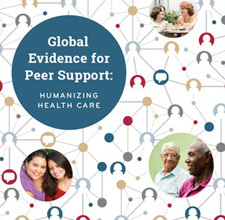 It’s widely accepted that social support can help people achieve these health goals. However, did you know that social support can even protect you from catching a cold? A recent study examined the effects of hugging and perceived social support on a person’s vulnerability to respiratory viruses. At the start, participants were interviewed by telephone on 14 consecutive nights regarding the availability of social support. These nightly interviews asked questions about social activities, interpersonal tension or conflicts, and whether participants had been hugged. Relationship styles are typical patterns of expectations, needs, emotions, and behaviors in social interactions. They can be categorized as Insecure (Anxious, Avoidant), or Secure. Each of these relationship styles dictates different modes of behavior, some of which may present challenges when helping your peer. Most people with mental illness demonstrate insecure relationship styles due to lack of security during times of distress in childhood, which lessened resilience during stressful times and caused emotional issues and poor adjustment….